It's Katie's 20th birthday today. Twenty years ago today, I woke up at a little after 4:00 a.m. I started writing numbers down on a piece of paper (which I still have): 4:19, 4:25, 4:29, 4:35 -- 5:17, 5:23, 5:30 -- 6:53, 6:57, 7:03, 7:10 -- some of these were written in DH's hand, some of them have numbers following them, signifying duration, I think, and a couple of have the words "very mild" written after them. There's one line that reads, "Shower 3 or 4." Yep, it's a record of my contractions. They pretty much started off at 5 +/- minutes apart and stayed that way all day. I sent DH to work, and called my doc (the only person I know from Saskatchewan) to see if I should wait and keep my regularly scheduled appointment that day or just come in whenever. I kept track until 11:24 when I left the motel. I drove myself -- in a manual transmission Subaru, hitting the clutch between contractions -- the 15 miles to DH's workplace so he could take me to the hospital. At 10:00 p.m., I finally gave birth to a 6 lb. 10 oz., 20" redhead. Happy Birthday, Katherine! Oh, that's right! We were between houses/closings and were living in a motel! Rusty (aka, DH) visited on our "tour of homes" when we were in Oregon three years ago. That was something... you do what you need to do, eh? Kate has about another week in Portugal, then she's going on "vacation" in Scotland with her friend Shannon. After that she has gigs in NYC and in LA, and she'll land at home for a while in mid-June. You do what you need to do, eh?? There's another FO... I think that's the opposite of "unraveled"! Ginny tried them on last night -- including the one that needed a kitchenered toe and still had needles in. She was so happy and excited, "Are they done yet?" I almost sewed it up right then, but the reality of kitchenering a toe in the middle of a 3-kid whirlwind kicked in and I resisted the urge. Instead we spent some time outside, had hot dogs, decorated a cake (sort of Jackson Pollock style), and then sang Happy Birthday and blew out candles when Ali & Rod returned from their birthday date. I just love Ginny in that video! And Jün with his sweet "mistakes." Haha. I'll be casting on today, and am hoping to have the baby pair done by May 5th to show as a sample. I/Make.Do have been invited to do a pop-up show at my new LYS, Casting On, on the Sunday of the local Spring Fiber Frolic (yarn crawl)! I'm so excited! And looking forward to spending some time in the dye studio over the next couple of weeks! I've been humming/singing all morning: "I am sixteen, going on seventeen..." Today kicks off our birthday season with Ali's 17th. She/her friends are planning a little get together tonight -- they insist that she go to the local coffee shop (where they must have something planned) and then they'll come over to our house. Last year, they'd made a big cardboard cake out of boxes and a boy popped out -- in only his underwear! I can't imagine how they'll top that, but I'm sure they will!! So, 17 years ago today I felt twinges when I woke up, but decided to go to my preggo exercise class, anyway. That certainly got things going a bit more, but I didn't stop there -- went to work to pick up the resume that I'd been working on for my brother AND delivered it to him at his job. Yep, things were really going then. I called my husband (to take me to the hospital) and my mother (to watch Katie) and did my best to manage 'til they got there. I tried to remain calm -- Kate wasn't even two and I didn't want to alarm her. I recall laying on the floor with Katie bouncing a big ball all around me. The troops arrived around 1:30, I continued popping Tums like they were candy in the labor room (heartburn all through that pregnancy -- just the thought of green peppers had me gurgling), and Alison Louise arrived at 3:30. When they told me she was another redhead, I didn't believe it 'til I saw for myself! Wow!!! And spring arrived that day. I literally watched the leaves pop out on all the trees from my hospital room. It was Easter Sunday when they let me go -- 70 degrees and we had a picnic dinner outside! Seventeen years... seems like yesterday. I can do the math -- she was 17, I've been blogging for 15 years -- but WHAT?? I still remember Kate bouncing that ball around me, that terrible heartburn, and Ali's arrival... Thirty-two years, a husband and three kids of her own... and it still seems like yesterday. I "enjoyed" a 3-day weekend, dampened just a bit by the onset of a cold and, of course, income taxes. Whatevs. Three days off = three naps! Taxes are done & dusted; I wasn't in the mood to agonize... it could've been (has been) worse. We had Airbnb guests arriving on Friday afternoon, so I spent the morning readying. A new duvet cover, lightweight cotton blanket, and decorative pillow cover were fun additions to the bedroom. I also added black-out liners to the curtains (after cutting & hemming them). The bottom photo was taken this morning. You can still see a little snow in the back yard and ravine. We were in the middle of a blizzard at this time last year, left to deal with a couple of feet of snow... so I'm not complaining. Otherwise, I just blew my nose a lot while I did some sewing and knitting. I'm getting close to finishing the first sleeve of my Alabama Chanin Car Jacket. There are more photos on IG, if you're interested. And Ginny's Rye socks will be finished as soon as I kitchener the toe. My energy & enthusiasm are still pretty low. The sun is shining and that helps! Hope you had a great weekend! Janel & Kristin recently changed the menu and I had a gift card that I kept forgetting to use (third time's the charm!). Oh yum. We had/shared the Cheese & Charcuterie Platter, Asian Chicken Meatballs with Pickled Veggies, and Roasted Beet, Pesto & Burrata Salad, along with beverages... and we were too full for dessert! I almost doubled that order of meatballs... I'm glad I didn't because they were huge! Oh darn, dessert might have to be a separate trip sometime. While procrastinating about finishing our taxes*, I spent the weekend catching on up sleep (also possibly fighting off a cold or something) and long overdue mending & sewing, finishing a baby sweater, putting together a stubborn IKEA bench, shopping & cooking, cleaning/readying the Airbnb apartment, and hanging out with kiddos! The kids and I started out riding bikes, but ended up taking a walk down in the woods and on the trail below our house. I thought this dead tree looked like a dragon or a gnarly dinosaur. And was delighted to find even the smallest promise of spring (as I'm watching sn*w flying around outside my window this very moment) (they say we could be close to 70°F on Sunday - it's spring, indeed)! This morning's sunrise was a beauty! I've been thinking about a 100-day project for a while, stymied a bit at what I'd actually do, but it came to me just as the #The100DayProject came along. 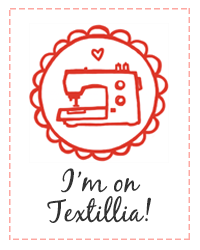 Starting tomorrow, I am committing to at least :15 of sewing each day on my Alabama Chanin Car Jacket! I'd really like to finish that project... because there are so many more projects that I'd like to sew! I'm looking forward to setting up a dedicated project work space, and getting to work. *I will get them done... I've never been late nor filed for an extension, and I don't aim to start now. We returned from vacation on Monday, which happened to be Malina's 1st Birthday! This is one of my favorite photos* from the day of her birth. Ginny was sleepy... and obviously not so sure about early morning developments! Junah also looks sleepy, but he is the dreamiest lovingest cuddliest kiddo in the early morning and he looks slightly more accepting and intrigued! It's been a fantastic year!! She's the happiest baby and has quite the personality these days, and it won't be long before she's walking!! Watch out world! *Photo by Mary Nieland of Fox Valley Birth and Baby. Another of Mary's images from that day won 1st place category winner in the 2019 Birth Becomes Her Image Contest! T is for... Try, try again! We're flying Iberia to Spain next week and, though I was tempted by their very nice offer to upgrade to Business Plus, with its diverse menu, wine cellar and reclining bed, I opted to just choose and/or purchase our Economy seats in advance. I tried and tried and tried... and finally, this morning, was able to make it all the way through the process -- in English and without getting kicked off the site. We have confirmed seats on every leg of our journey, now, except from Valencia to London, and that's a fairly short flight so I'm not too concerned. It's the 8+ hours on a plane when I need a little wiggle room... preferably with a view. We're so excited to explore the Costa da Morte in the Atlantic Northwest! I feel very lucky to be going there -- thanks to cheap flights -- because it would be way too far for us to drive there from Valencia, given our timeline, even for road-tripper vacationers like us! I thought that Spain was probably a little bigger than Wisconsin, but didn't realize that it's 3X bigger!! It's release day for Mason-Dixon Knitting Field Guide No. 10: Downtown! F is for... (not) Freaking out! This weekend will be devoted to laundry & packing. And, hopefully, watching some snow melt. P.S. I didn't receive a single email notification of comments on yesterday's post! Ugh. It's such a pain sometimes. Typepad said that they had some problems yesterday morning, but that all seemed to be working by afternoon. I still haven't received a notification. I'm curious about today. It's kind of a pain responding to comments when I don't get an email. Thank you all, so much! I am thrilled that I was able to find such a perfect gift idea for Lady Kate, and love that some of you might have future Lairds and Ladies in the family, too. 1 -- With the help of my fashion consultant, Kate, I ordered new glasses yesterday! I went to a new place because... long story. It's very close to work, though, and they let me take some frames home to try/get opinions. I was OK with the couple that I brought home, but knew that I could use another set of (better) eyes to help me choose. My consultant will soon be leaving for an extended period, so I grabbed her while I could! They're going to be my first pair of Transition* lenses... and I sure hope I like that! I was assured that if I truly hated them, they'd re-grind. *ETA: Transition sunglasses. I've never had anything but no-line bifocals since that became part of my prescription. Speaking of glasses, as I wiped mine off for the zillionth time the other day, I thought a) wouldn't it be cool if they could make lenses out of Gorilla Glass? And b) if I could use that amazing liquid screen protector stuff on them? 2 -- We welcome our second Airbnb guests tomorrow night, a couple on a weekend get-away from Milwaukee -- another "reason" that we never considered! We usually get away to there! Haha. 3 -- My gorgeous amaryllis is fading but still gorgeous... and there's so much promise!! The days are getting longer y'all! We're up to over 11 hours of daylight (and gaining every single day)! There's reason to open the blinds when I get up in the morning now. The colors were so soft and beautiful at dawn today, and then I noticed that the moon was still hanging there, too. There isn't usually much idle time in my world, but sometimes things really rev up for one reason or another, and I feel like this is one of those times. I'm a go-go all the time-o! I had off last Friday and started with an early morning eye exam, followed by a visit to my chiropractor, and then zipped home to gather up Gin & Jün and jump into Kate's car for a trip to The Big City! Our destination was the Milwaukee Public Museum. This fascinating if graphic exhibit, punctuated by special effects of the thunderstorm variety, was... endlessly fascinating to these two! And, hopefully, not too traumatizing! No, wait, it was the ESCALATORS that were even more fascinating. Haha! I can't believe I'd never been to this museum before!! We also enjoyed the butterfly exhibit. And this ^^^ was just incredible to see! The museum also has an "Old Milwaukee" exhibit with a trolley car, cobblestone streets, and shops. It morphs into the "European Village" exhibit wherein each house, room, or shop is decorated in the traditional manner of a different country. I was more than delighted to see plentiful knitting in the Latvian Room! There was also knitting in the Irish House. You can see just a bit of a spinning wheel to the left. And I noticed St. Brigid's Cross on the wall as I cropped the photo! There was knitting/spinning evident in other rooms, too. Saturday was Day 1 of the Best Picture Festival, which began with a screening of all the nominated Live Action Shorts. Holy moly. The BPF wraps up this Saturday and begins with screening the Animated Shorts. They had adorable "OSCAR" statues made of balloons flanking the theater entrance, and handed out ballots at the end of the evening so we can all play along at home. In other news, I'm knitting a sweater for Malina. It's in Malabrigo's WASHTED which I purchased at my new LYS, Casting On. If the sweater is a little bit big -- perhaps fitting her sister -- I won't really mind. I did rip & re-do the sleeves last night, though, as it looked as though I was knitting for a baby gorilla! Lastly, I'm going to blast you with amaryllis photos. There are four flowers in full bloom and another just opening. There is also another bud coming up. This plant is much smaller and daintier than the big ones I'm used to from the grocery store or wherever. It's just stunning. In the last photo, you can see two bud stalks from the larger plant that have also finally started to grow. So exciting. Our Airbnb guest checked in on Monday and sent me a wonderful message about how beautiful the place was and she could move right in... that's always the stick by which we measure, too! Whew. I can hardly believe we're mid-week and March is right around the corner. Ya-freakin'-hoo. Thing 1: It's Go Time! I mentioned the other day that we published Kate's/the upstairs apartment on Airbnb, and that there had been some interest. One canceled booking by a woman whose son attending a nearby university would be recovering from outpatient surgery; upon further review, it turns out a traditional hotel (with long walkable hallways) would be better suited for his post-op needs. Two declined bookings: one because the apartment wasn't suitable (she didn't read the listing limitations); the other because of too short notice! Two that weren't possible: one because the number of guests suddenly increased and exceeded our capacity; another was a pre-approved request for dates that someone else snagged before it was accepted! There are two confirmed bookings! The first one is for Monday-Friday -- as in this coming Monday! So we are getting all the last-minute things done. And Kate, in the meantime, is also packing for a quick work/art trip to Nebraska... also keeping in mind upcoming longer trips to the UK & Europe! It's all a little crazy. The other confirmed booking isn't until mid-April, but who knows what will happen between now & then! We truly didn't expect much until summertime, and then... maybe a family reunion, a wedding. None of these bookings or inquiries are for reasons that had even crossed our minds. So. What do we know?? Haha. Thing 2: It's Almost Drive Time! I need to get an International Driving Permit (IDP) for Spain... a trip that is coming up right quick! (YIKES!!) I've had my application filled out for weeks, and finally had Rusty take some "passport-type photos" the other night, which I sized & printed, so I could bring the whole she-bang with me yesterday. Then I noticed that they required check or money order, and didn't accept cash... I don't know about you, but I haven't carried my checkbook in a very long time. I needed to make a deposit for work and happen to have my HSA account at the same institution, and they let me draw a $20 MO from there. I happily made my way to AAA and she told me that my photos were too big (even though they were processed to passport specs -- GAH!!). They could take photos there, and I'd have done it... if they'd accept a credit/debit card from a non-member, or I'd had a check with me, or a MO for $32 instead of $20. GRRR. I resized & reprinted photos last night -- and tucked a blank check into my wallet -- and will try again today! Thing 3: It's Yarn Time! I've never knit a Fade (though I have printed out at least a couple of patterns), but that almost looks like it could be one! I've had some fun in the dye studio over the past couple of weeks. I've made it a point to put "DYE" on my calendar on my days off -- making it a priority on those days, not just a thing I do when I have time. There are a few last-minute tweaks before a website update later today -- shooting for noon CST! Our Ginny girl, stylin' and stayin' warm!! On the heels of brisk & clear moon-gazing days is the first major snowstorm of the season... and every time I look, the predicted snowfall grows! There could be a foot (and counting).